Dubai: Don’t forget your umbrellas and jackets on Tuesday as forecasters expect rain in most parts of the country, and thundershowers especially in the northern and eastern parts of the country. An extension of the surface Red Sea trough over the country and over east and southward of the Arabian peninsula, accompanied with an extension of upper air trough, is affecting the country. Because of this, forecasters expect some light showers on Jebel Jais and the islands on Monday. On Tuesday, different intensities of rain may hit the country but the rainclouds may dissipate by evening. Fresh southwesterly to northwesterly winds, becoming strong especially over the sea, may cause hazy conditions due to blown dust in exposed areas. 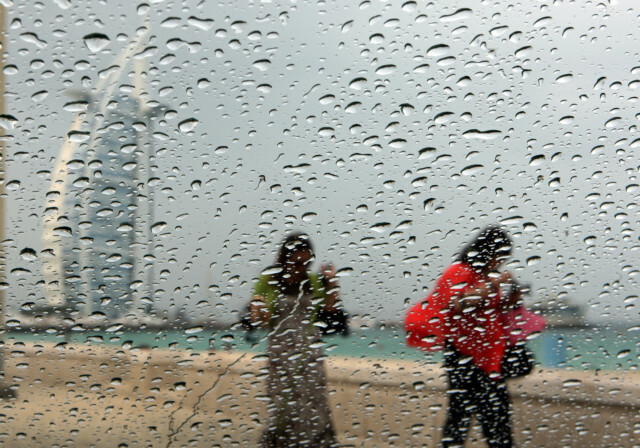 Rain and wind could bring the maximum temperature down in Dubai by five degrees from 27C on Monday to 22C on Tuesday. On Wednesday, the UAE will have partly cloudy skies in general. Internal areas will be humid at night and early morning. Northwesterly winds will be fresh becoming moderate by night, with speeds between 15km/h and 30km/h, reaching a maximum of 40km/h. The Arabian Gulf will be rough to very rough at times. Oman Sea will be rough on Tuesday, while the Arabian Gulf will be rough becoming moderate by night on Wednesday. Oman Sea will be moderate on Wednesday.